So April comes to a close, and with it the April 2018 Retro Challenge. I’ve spent the month of so buried in these Osborne 1 computers, and have achieved a great deal in restoring them to their former glory. All the details are in the last 17 blog posts, but I’ve also made a 36 min video summarising everything I did (along with a slightly closer look at the computers and some demos). 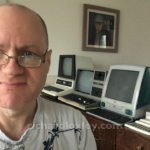 This entry was posted in Retro computing and tagged Osborne, rc201804, retro, retrochallenge on 30 April 2018 by Richard. 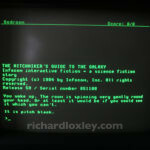 Osborne Restoration part 17: text adventure games! Yesterday I figured out a workflow for getting CPM software onto disk images that I could run on my Osborne computer. This entry was posted in Retro computing and tagged Osborne, rc201804, retro, retrochallenge on 28 April 2018 by Richard. 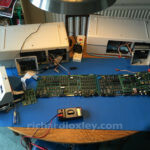 Now my Osborne 1 is working well, it’s time to transfer some software onto it. I have a handful of disks that came with it (just business software), but there is a whole wealth of CPM software out there, if only I can get it onto the machine in a format it can read. Today’s task is to find a workflow that enables me to download CPM software from the internet, and easily load it onto the Osborne. This entry was posted in Retro computing and tagged Osborne, rc201804, retro, retrochallenge on 27 April 2018 by Richard. In my previous posts I’d proved a Gotek/FlashFloppy USB floppy drive emulator would work with my Osborne 1. I’d also found a way to install it in a floppy disk storage pocket on the machine. I then had to wait for more components to arrive, to finish it off in a neat package. 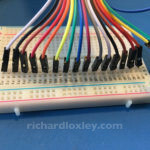 This entry was posted in Retro computing and tagged Osborne, rc201804, retro, retrochallenge on 25 April 2018 by Richard. In my last post I had successfully got a Gotek/FlashFloppy USB floppy emulator working with my Osborne computer. For future use, I still wanted to design a way to copy any additional files as and when I needed. I’d already experimented with RS232 serial transfers. 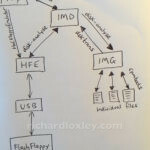 I had also wondered about leaving a floppy cable installed somewhere in the machine so I could attach a USB floppy emulator easily when I needed to, but it was in no way obvious how to do that without leaving the aesthetics of the machine a bit ‘messy’. Today’s job was to solve that dilemma. This entry was posted in Retro computing and tagged Osborne, rc201804, retro, retrochallenge on 24 April 2018 by Richard. In my last post, I had tried to get my Gotek/HxC USB floppy emulator working reliably with my Osborne computer. For some reason the drive select signals from the Osborne weren’t getting through correctly to the Gotek/HxC. This meant I couldn’t use a physical drive at the same time as the emulator (for example to copy files between real and virtual disks) as the computer couldn’t select between the drives. Today it was time for a different approach. My next stage with my Osborne computer was to bulk transfer CPM software I’ve downloaded from the internet onto the computer. In last year’s Retro Challenge I made my RetroMatic 2000, which included a USB floppy drive emulator based on Gotek hardware with HxC firmware. I’d already tested that this worked with the Osborne with a custom cable, so my plan was to open up the Osborne, connect the cable, copy all the software to real floppy disks, then reassemble the computer. This entry was posted in Retro computing and tagged Osborne, rc201804, retro, retrochallenge on 23 April 2018 by Richard. 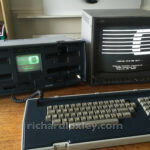 The story so far: I’ve bought two Osborne 1 portable computers (circa 1982) and am trying to get both working. The first one (henceforth known as the “bad” one) had no boot disks, but would power on to a boot screen. I couldn’t get it to boot from a USB floppy emulator with an appropriate disk image, and when I subsequently obtained genuine boot disks it wouldn’t boot from them either. The second one (henceforth known as the “good” one) was in much better condition, came with boot disks, and was generally working. I’ve restored it (re-capped the PSU, cleaned the drives, fixed a broken key) and will be trying to get more software running on it. This entry was posted in Retro computing and tagged Osborne, rc201804, retro, retrochallenge on 17 April 2018 by Richard. The next step in my Osborne restoration is to look at the broken keyboard. My second Osborne came with a broken off ‘up arrow’ key. 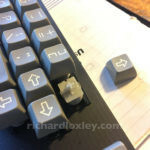 At some point someone had attempted a repair with Blu-Tack, but when I received the computer it was just stuck down with tape to keep it from going missing. Let’s see what I can do. This entry was posted in Retro computing and tagged Osborne, rc201804, retro, retrochallenge on 14 April 2018 by Richard. The one thing I hadn’t yet tested was the composite video output from the Screen-Pac add-on graphics board. Time to dig out my JVC studio monitor for some testing. 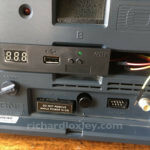 RC2019/03 update 5: Video Genie cassette interface fixed! 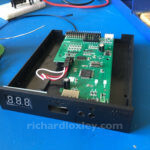 RC2019/03 update 2: Video Genie back from the dead!